Yes, a server. Not only can you download files from your MSX with FTP.COM, but you can also serve files stored in your MSX to other users anywhere on the Internet. 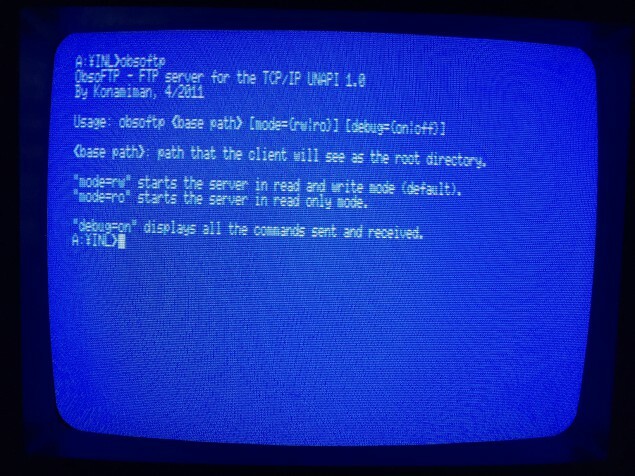 Running OBSOFTP.COM without any parameters show the usage. 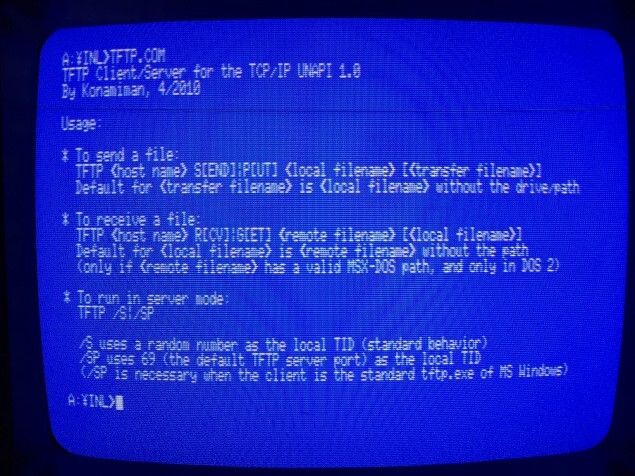 You need to specify at least the path that will be the root of the FTP server when clients connect. ObsoFTP can use the root of one of the MSX drives (I used C:\ when I left my FS-A1GT running as a server a couple days ago), or a directory such as C:\FTPDATA or whatever else you like. Optionally, you can also specify a file mode: read/write or read-only. In read/write mode anybody can upload new files, create/delete directories, or delete existing files in the server. In read-only mode nobody can upload or delete anything, only download is allowed. 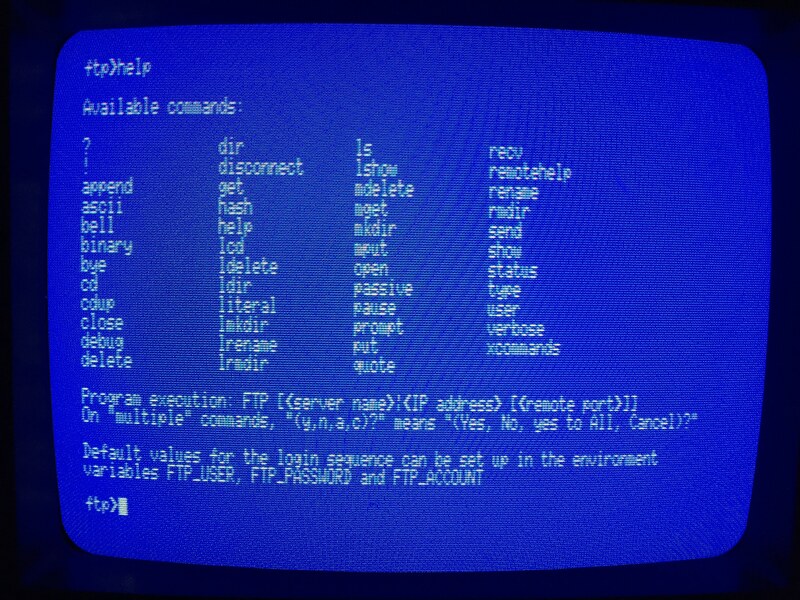 By default the server runs in read/write mode. 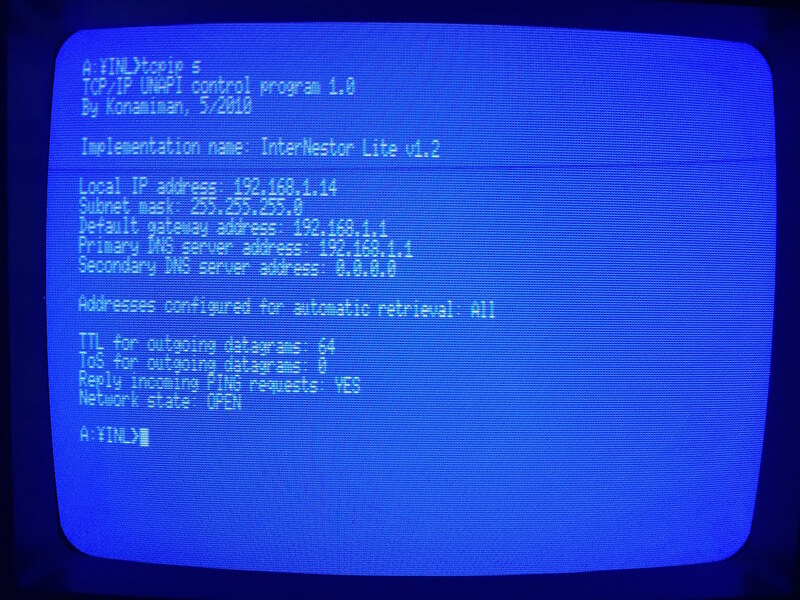 Needless to say, this is an excellent way to exchange files between the MSX and other computers in your home network. This is a simplified Telnet client. 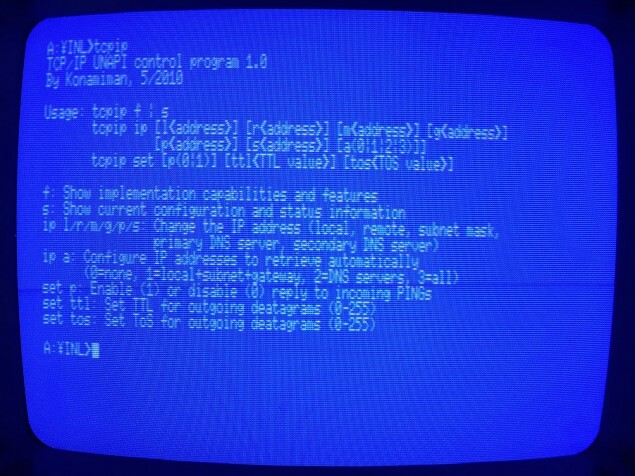 All it does is connect to an especific TCP port on a remote computer and then send to it everything you type on the keyboard, and displaying on the screen everything received from the other side. It doesn’t support some of the capabilities of an actual Telnet client and it doesn’t do any terminal emulation, so we may get garbled characters depending on where what machine we’re connecting to. 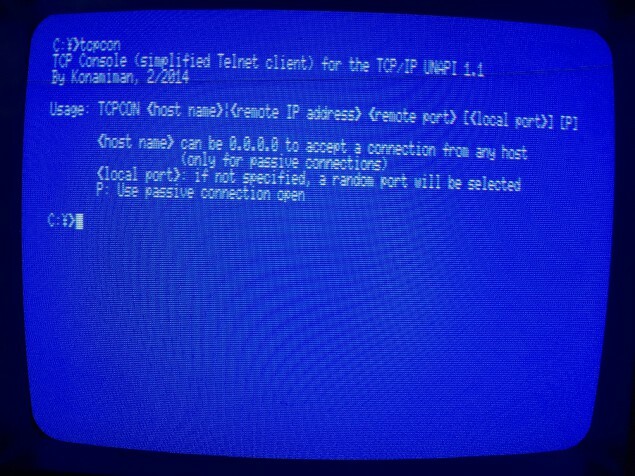 When running in passive mode TCPCON.COM will wait for a connection from a remote host on whichever port we tell it to. After the remote host connects everything works exactly the same: both computers send lines of text to each other. ObsoSMB is another file server, but this one uses the SMB protocol. What this means is that you can share a drive of your MSX (or more than one) with Windows and Mac computers in the same home network. To the other computers the MSX drives appear as network drives and can be used without restrictions (other than the 8.3 filename format, the transfer speed, and the limited size of the MSX storage). This isn’t a network application per se. You could call it a bookmark manager. The reason for it to exist is simple: some web sites have very long addresses and it’s annoying to type these again and again to download files with (for example) HGET. You can keep your bookmarks in a text file and give them an easy to remember alias. 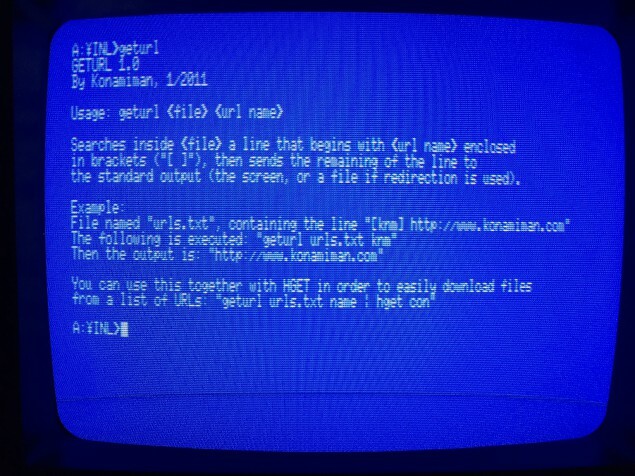 GETURL converts the short alias to the full URL, which you can then pipe into HGET in order to download something. DBFOPS.COM: File operations manager. Used to list the content of folders, create folders, and move/copy/delete/rename files and folders. This program requires some additional configuration and another computer to act as a middleman. This is because Dropbox requires the use of encrypted HTTP connections (SSL). 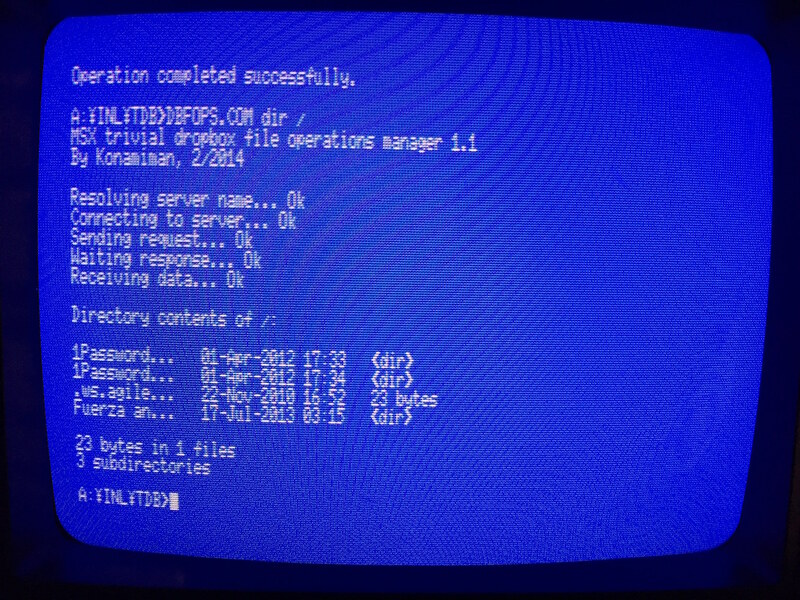 The MSX CPU can’t handle the encryption/decryption process, so another computer is required to handle this step. 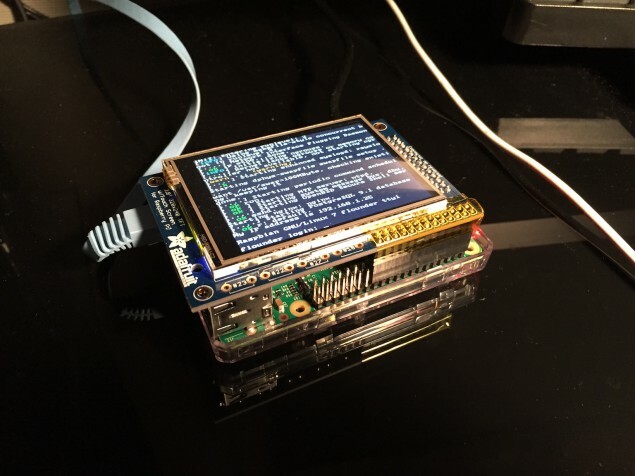 During my tests I used a Raspberry Pi computer to perform this function. 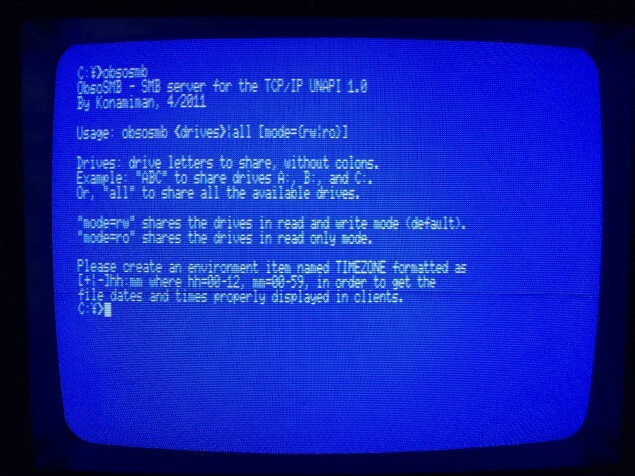 I will dedicate another post to how to set up and use MSX Trivial Dropbox, because the process is too long to describe here. TFTP is a very simple file transfer protocol. 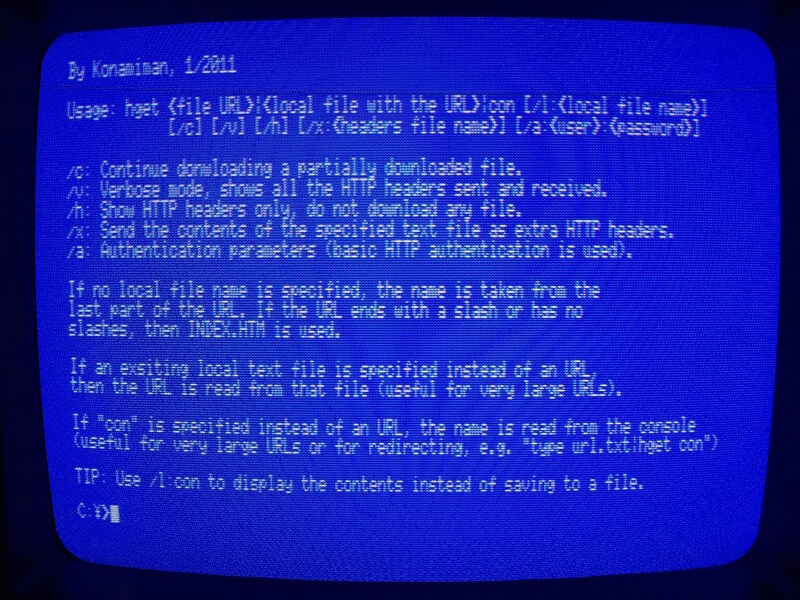 It’s often used to boot computers from a network file instead of a local disk, but it can be used to transfer files between computers as well. And it is much easier to start a TFTP server on the MSX than on a Windows or Linux machine! The other program to perform advanced tweaks is ETH.COM. 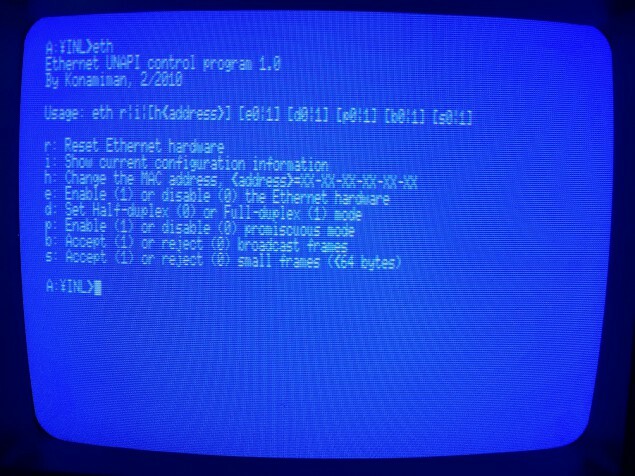 This one allows you to directly handle the Ethernet controller in the cartridge and even change the MAC address via software. Usually you won’t need to touch these options, but it’s nice to see that we can modify these settings if we want. The Ethernet controller supports transfer speeds of up to 10 Mbps (about 1.2 megabytes/s). However, the MSX CPU can’t handle that much, even in an MSX turbo R running in R800 mode. 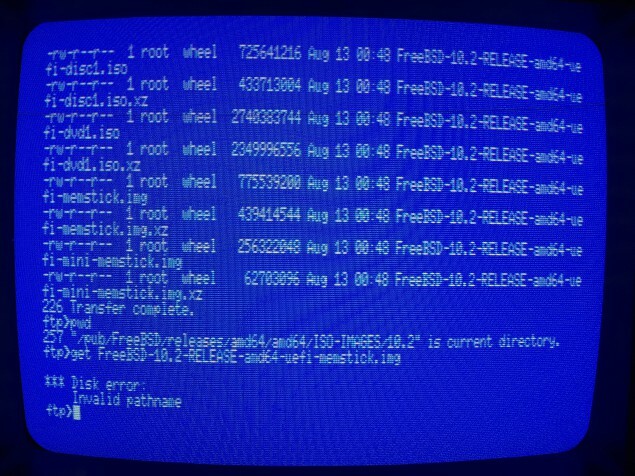 InterNestor Lite processes one input frame and one output frame per display interrupt (60 times per second). These frames are about 500 bytes long, so the maximum absolute data rate supported by InterNestor Lite is a bit over 30 KB/s. In practice it is much less than that because of the processing overhead. In my tests I reached download speeds of up to 12-13KB/s. This is a very useful piece of hardware. Together with InterNestor Lite, the Tecnobytes MSX Ethernet Cartridge opens the doors of the Internet to the MSX. We no longer need to have another computer to download from the network, and sharing files over FTP or SMB is much easier (though slower) than using removable media. The software still has rough edges, but being able to do so many things from an MSX is a very big deal. In my opinion, these are the best $60 I’ve spent on my MSX so far.